Cala'n Forcat has three small yet attractive beaches squeezed into rocky coves on this western stretch of coastline. Be warned it is a steep climb to the coves at the north end of town. Head to neighbouring Cala'n Blanes though and you’ll find a large sandy beach and warm shallow water, which families with young children will love. There is a mini-train that runs along this stretch of coast enabling you to reach the local beaches with ease and you can hop on and off whenever you see somewhere you fancy exploring. The other option is to take a boat trip along the coast, allowing you to have a cooling dip in the sea and relax on the fine white sand of empty beaches away from the resorts. Cala'n Forcat has a Centro Commercial Shopping Arcade with numerous small shops selling everything from souvenirs to food. If you want more variety take the local bus into Ciutadella and enjoy city shopping. It’s worth spending a day in Ciutadella to explore its historic centre, sit and relax with a glass of wine in a bar and take a stroll along the harbour at sunset. There are plenty of activities to keep the whole family entertained on holiday to Cala'n Forcat. As well as the wide range of water sports on offer at the coast, the whole family can go horse riding at nearby Son Angel, a farm situated east of the resort. Afterwards you can enjoy the Menorcan countryside with a walk through a peaceful wooded valley to the unspoilt beach of Playa Algaiaren. Pack the sunscreen because a fun filled holiday of beaches, water sports, food and entertainment for the whole family awaits you at Cala’n Forcat. 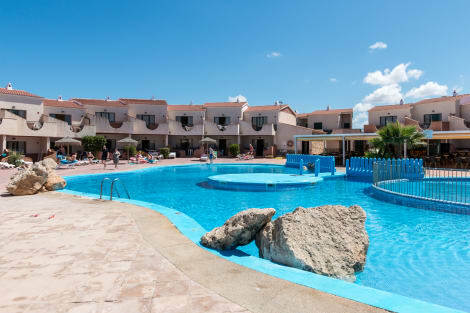 If you’re craving sunshine then book with lastminute.com today and very soon you can be enjoying all that a Menorca holiday has to offer with an affordable getaway to Cala’n Forcat.